Highlighting the first-ever playwriting exchange between Croatia and the United States, this evening will showcase the work of young Croatian dramatists Ivana Sajko and Tena Štivičić, featuring a brief presentation on contemporary theatre from Croatia, excerpts from both author’s plays in both Croatian and English, and a discussion with the participants in this exchange. The event is hosted by the organizers of this international initiative, Ivan Talijancic from WaxFactory (USA) and Jasen Boko (Croatia). WaxFactory’s USA/Croatia playwriting exchange is funded by FACE Croatia foundation; NYSCA; Ministry of Culture of the Republic of Croatia; Department of Education, Culture and Sport – City of Zagreb; Department of Culture – City of Split; ZKM / Zagreb Youth Theatre; and the Croatian Center of the International Theatre Institute (ITI). Ivana Sajko was born in 1975 in Zagreb, Croatia. She graduated dramaturgy from the Academy of Drama Arts and took a master's degree in literature from the Faculty of Philosophy, Zagreb. Apart from being an obsessive writer, also a dramaturge, producer, theatre theoretician and author of radio broadcasts and multi-media projects she won several prizes for drama literature. Her plays are translated into English, German, French, Slovenian and Slovakian and staged in theatres and radio broadcasted throughout the world. Also performed by the author through auto referential reading. Her play Žena-Bomba (Meandar, Zagreb 2004) is currently a theatre hit, and the latest big premičre was held at the prestigious Melbourne Malthouse Theatre. Preceded by Smaknuta lica: četiri drame o optimizmu (Meandar, Zagreb 2001). Her co-operation in publishing projects includes the artists from different fields: American composer David Simons (CD Mass for election day silence, 2004), Dunja Vejzovic (Documenta, 2003), visual artists such as G. Petercol (Radna monografija, 2002) and G. Trbuljak (the Venetian Biennale 2005). Member of the editorial board of the theatre journal Frakcija and the literary journal Tema. Edited and presented the first broadcast about contemporary theatre V-efekt on the Croatian Television (HTV). Co-founded the theatre group BAD co. Visiting lecturer at the Academy of Drama Arts, Zagreb. She lives in Zagreb and Istria, Croatia. Tena Stivicic was born in Zagreb, Croatia. She graduated from the Department of Dramaturgy at the Academy of Drama Art in Zagreb, and then completed an MA in Writing for Performance at Goldsmiths College, University of London. She took part in Future Perfect, the Paines Plough Young Writers Programme and the Royal Court's 50th Anniversary season, and BBC Bursary for young writers. Her play Fireflies was commissioned by the National Theatre Studio in London. Her plays Can't Escape Sundays, Perceval, Psssst, Two of Us, Goldoni Terminus and Fragile! have been produced in Croatia, Serbia, Slovenia, Bosnia, Germany, Switzerland, Slovakia, Greece, Italy and the UK. Fragile! was awarded the Special Jury Award at Marulicevi Dani Festival, Croatia; Best Play at Dani Satire Festival, Zagreb, Croatia; Best Play at the Borstnikova Srezanja in Slovenia; and the Special Jury Award for Theatre Innovation at Male Scene Festival, Croatia. In 2007, she co-wrote the play Ptjona no! 1918 [Drunken Night 1918] with her father, lvo Stivicic for Ulysses Theatre, Zagreb. Tena's latest project, Goldoni Terminus, was shown in July 2007 at the Venice Biennale. She lives in London and writes in English and Croatian. In 1993/1994 he was Fulbright scholar in Playwriting and Screenwriting at Tisch School of the Arts, New York University. During the last 15 years his plays for children and young audience, had over 30 stage and radio productions in Croatia, Slovenia, Serbia and Bosnia and Herzegovina and were awarded several times at different international festivals. Since 2000. he has been working as a part time professor at the University of Split, teaching Drama and Theatre in Education. He has published six books, The Theatre Class and Other Plays (1994), New Croatian Plays, Tin – Thirty Years of Travel, biography of famous Croatian poet Tin Ujevic (2005), Fifth Side of the World, travel essays (2006), book of theatrical essays Writings from the Theatre Darkness (2007) and Following the Silk Road – in the Traces of Marco Polo (2009). From 2005. Jasen Boko is a President of the International Playwrights Forum (part of International Theatre Institute, UNESCO), member of The Croatian Guild of Drama Artists and The International Federation of Journalists. He lives in Split, Croatia. Ivan Talijancic is a multidisciplinary artist: director, choreographer, visual and graphic designer, video- and film-maker, as well as a curator. 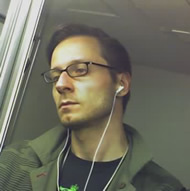 As a co-founder and artistic co-director of WaxFactory, he directed Lulu, Quartet V2.0, and a site specific installation/the performance Ladyfromthesea, staged in thirteen interconnected indoor and outdoor locations (Old American Can Factory in Brooklyn, New York,) and praised by Ballet-Tanz International’s worldwide critics survey as one of “most innovative productions in 2001”. Ivan also directed Sarah Kane's Cleansed at Exodos Festival, and …She Said based on the work of Marguerite Duras, which premiered in 2005 in co-production with Cankarjev Dom in Ljubljana, Slovenia, and was subsequently presented at the ICA/Institute of Contemporary Arts in London, Act French festival in New York and FIT/International Theatre Festival in Caracas, Venezuela. Ivan has worked on opera productions with Robert Wilson and Julie Taymor. He studied theatre at the University of California, San Diego, and received his MFA in Directing from Columbia University, New York. Most recently, Ivan staged X, a video-opera he created in collaboration with the composer Katharina Rosenberger, which premiered in August 2007 at the Zürcher Theaterspektakel in Zurich and went on to perform at La Batie festival in Geneva, Switzerland, and Malfi, an adaptation of John Webster’s The Duchess of Malfi in collaboration with Simona Semenič at Mladinsko Theatre in Ljubljana, Slovenia in May 2008. In the fall of 2008, he staged Blind.ness, an original WaxFactory project, at PS122 in New York.